Reactions are a feature of WordPoints that allow you to configure how WordPoints should react to different events that occur on your site. 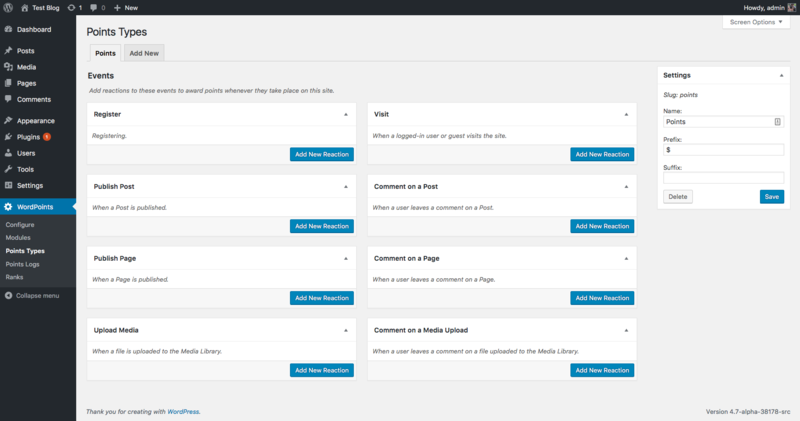 On the WordPoints » Points Types administration screen, you can create reactions that will cause WordPoints award points to your users when they perform various actions on your site. The main place that the description is currently used is in the How to Get Points shortcode. The description is also displayed in the title bar of the reaction once you have created it. This makes it easier for you to identify the reaction, if you have several different reactions to a single event. This is where you select who points should be awarded to when this reaction is triggered by the event. The options available here depend upon the event, and sometimes there may only be one option. At other times though, you’ll have several choices, like in our example above with the Comment on a Post event. You can select Comment » Author to award the points the author of the comment that was left, or Comment » Post » Author to award the points to the author of the post that the comment was on. 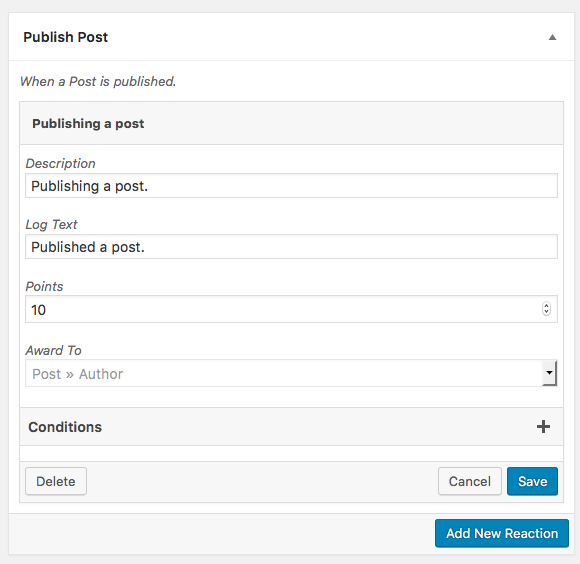 To award points to multiple different users involved in the event, just create multiple different reactions; one to award the post author, and one to award the comment author, for example. Other reaction settings, like Conditions, are made available by various extensions of the reaction feature. You can learn more about them here.